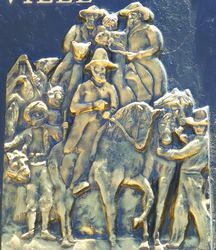 A monument with bas relief sculptured plaque, commemorates the 150th anniversary of the Burke and Wills Expedition. 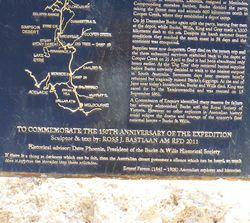 The plaque and text by Ross Bastiaan details the history of the expedition and their passing through Birdsville as well as a detailed biography of the members of the expedition. 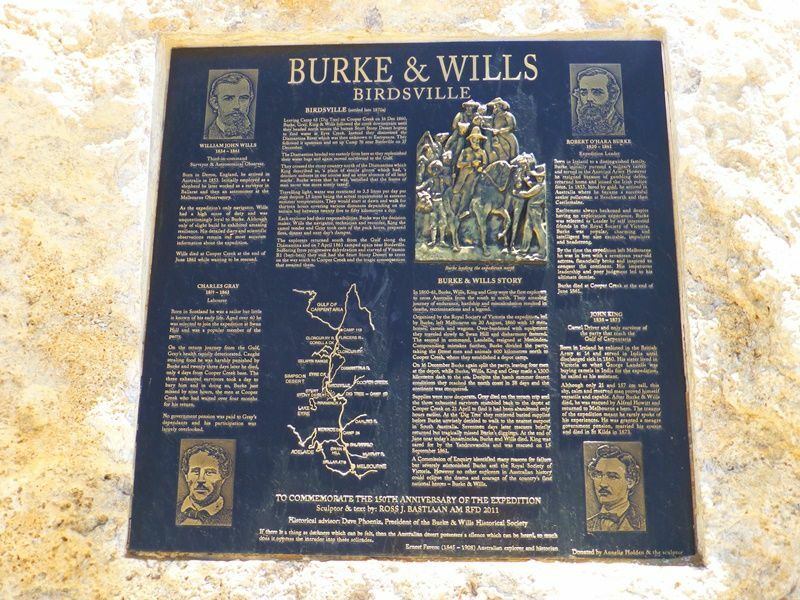 The Burke and Wills expedition was an expedition organised by the Royal Society of Victoria in Australia in 1860–61 of 19 men, led by Robert O`Hara Burke and William John Wills, with the objective of crossing Australia from Melbourne in the south, to the Gulf of Carpentaria in the north, a distance of around 3,250 kilometres (approximately 2,000 miles). At that time most of the inland of Australia had not been explored by non-Indigenous people and was largely unknown to the European settlers. The expedition left Melbourne in winter. Bad weather, poor roads and broken-down wagons meant they made slow progress at first. After dividing the party at Menindee on the Darling River Burke made good progress, reaching Cooper Creek at the beginning of summer. The expedition established a depot camp at the Cooper, and Burke, Wills and two other men pushed on to the north coast (although swampland stopped them from reaching the northern coastline). 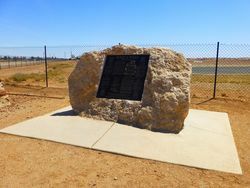 The return journey was plagued by delays and monsoon rains, and when they reached the depot at Cooper Creek, they found it had been abandoned just hours earlier. 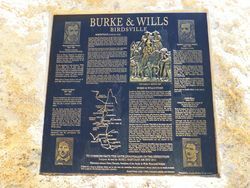 Burke and Wills died on or about 30 June 1861. Several relief expeditions were sent out, all contributing new geographical findings. 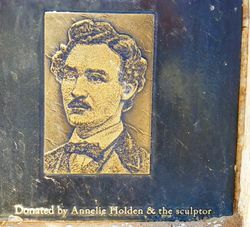 All together, seven men lost their lives, and only one man, the Irish soldier John King crossed the continent with the expedition and returned alive to Melbourne. If there is a thing as darkness which can be felt, then the Australian desert possesses a silence which can be heard, so much does it oppress the intruder into these solitudes.